Almost as soon as they settled into their new home, back in 2009, our caretaker couple — Troy and Paula Scott — installed three strobe cameras. As avid hunters, they were interested initially in monitoring the movements of deer over our square mile of mountain property. But soon they were capturing other creatures on their cameras, especially at night. Paula quickly became the chief monitor of their cameras, and when the company that produced their strobe cameras — Wild Game Innovation — came out with video cameras, they purchased three of them. Paula admits that monitoring the cameras throughout the year is addictive to her. She used to dislike winter, once hunting season ended, but now it’s her favorite time of year. That’s because she uses bait to attract a wide range of wild creatures. She hangs a discarded deer carcass by a wire from a tree limb, so it swings a foot or two off the ground directly in front of a camera. Of course, when bears are abroad, she does not use bait, although she did get a bear on the surprising date of February 27. And that’s what she likes most about the cameras. She learns more about animal behavior especially with the video cameras. 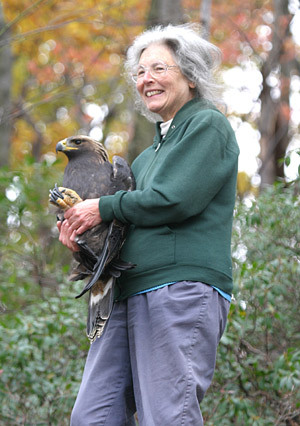 In less than two years, she has gotten excellent footage of 15 species of birds and mammals. Her favorite sighting so far has been of two different fishers that kept returning to the bait. One especially she describes as a “camera ham.” It swung back and forth with the carcass and often faced the camera. Then it turned on its back and rolled with the carcass. All the while it seemed puzzled by this strange source of food. Both Paula and I have had excellent sightings of fishers in our woods. We’ve also seen tracks in the snow. But the video footage of fishers gave us a whole new perspective on fisher behavior. Watching two raccoons and an opossum feeding peacefully around the carcass was another surprising behavior observation for Paula. “I figured they would be competitive and they weren’t,” she says. She was also surprised that an American crow fed beside five turkey vultures. And both she and Troy were amused and chagrined when an old hen decoy they had used to unsuccessfully attract gobblers years ago proved irresistible to six jakes at a time. She even has a video of a gobbler displaying in front of the decoy. 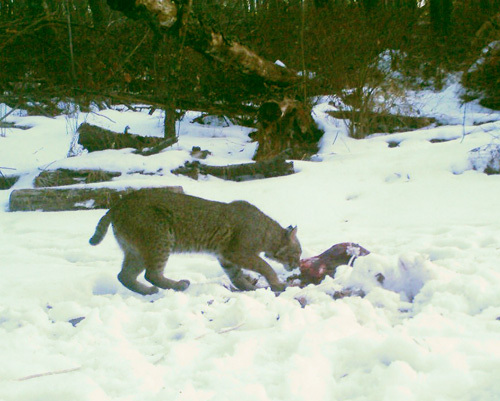 Besides the fishers, her other favorite sightings are several photos of a bobcat at the bait at night and a lovely video of a red-tailed hawk near the bait during a snowy day. I’m particularly fond of photos she has of red and gray foxes, despite the presence of coyotes in our area, because coyotes are supposed to prey on red foxes. Recently they used a camera to find out what was chewing on their new deck at night. As they suspected, it was a porcupine. Instead of killing it, they put a cayenne pepper mixture on the deck and so far it’s kept the porcupine away. Their original plan, to document deer, also has worked out well. They even have videos of a buck making a scrape and putting his scent on an overhanging limb. Paula cautions, though, that putting the cameras out during deer breeding season gives a false sense of the number of bucks in a hunting area because bucks come in from adjoining properties in search of doe. When targeting deer, they put the cameras along obvious deer trails, leave them for a month, and then switch them. For other animals, it depends on the time of year and how successful the location is in capturing wildlife footage. Learning how to obtain good images during the day means positioning them so that the sun doesn’t shine on them, otherwise, you end up with a lot of white footage, she says. You also have to hope that a bear won’t take issue with them. Paula’s brother-in-law Jeff had one ripped off and stomped into pieces, but so far they’ve been lucky. Only two cameras have been pulled down but not damaged. Discovering what’s out there has tempted folks throughout the world to invest in trail cameras. One writer friend, Ken Lamberton, recently posted on Facebook a beautiful photo of a cougar on a fallen tree in the Mule Mountains of southern Arizona where he and his wife Karen live. Speaking of cougars, Valentine, Nebraska businessman Kirk Sharp has 16 trail cameras posted around his ranch, which is a half-mile north of Rocky Ford on the Niobrara River in the wild north-central section of Nebraska. One of his cameras, mounted on a wooden fencepost, captured a cougar closely chasing a deer at 11:00 p.m. It was the first authenticated footage of a cougar chasing prey in the state, although since there was a deep canyon directly in front of them, no one knows the outcome. James Hill III of Waterford Township, Erie County, Pennsylvania wondered what was taking the suet at his feeders. Hill, the founder of the Purple Martin Society, has a 150-acre wildlife sanctuary. Although he figured a bear was probably doing the damage, he put out a camera with a motion detector. To his surprise it was a sow with two cubs sharing the suet with them. While individuals are enjoying their cameras, and finding out more about wildlife on their properties, so too are wildlife biologists. For instance, two researchers from Texas Tech University — Blake Gresham and Phil Borsdorf — have been studying the endangered lesser prairie chicken at The Nature Conservancy’s Yoakum Dunes Preserve near Lubbock, Texas. By erecting remote video cameras on 15 water tanks at the Preserve, they photographed 800 visits to the tanks by lesser prairie chickens, disproving the belief that the birds don’t need open water because they get enough moisture, except during drought, from succulent plants, insects, and dew. Gresham and Borsdorf found that hens especially needed extra water during nesting time because it takes a cup and a half of water to produce a clutch of ten eggs. Conservation organizations are also starting to utilize trail cameras. A recent article in the Philosophical Transactions of the Royal Society Biological Sciences entitled “Community Structure and Diversity of Tropical Forest Mammals: Data from a Global Camera Trap Network” recounts the results from the world’s first global camera trap mammal study. It involved nearly 52,000 candid shots of 105 mammal species from seven tropical sites around the globe. The camera traps, low on the ground, made no noise and emitted no light so poachers couldn’t spot them at night. But in Africa, elephants, like our black bears, don’t like strange objects in their territory and tried to crush them. The Central Suriname Nature Reserve in South America had the most diversity — 28 species — while Nam Kading in Lao Public Democratic Republic in southeast Asia had the least — 13 species. The other sites included Uganda and Tanzania in Africa, Indonesia in Southeast Asia, Brazil in South America and Costa Rica in Central America. They are also useful for studying large raptors. Dr. Todd Katzner at West Virginia University, along with Kieran O’Malley and Rob Tallman of the West Virginia Department of Natural Resources, is using them for estimating the size of the wintering golden eagle population in the Appalachians including Pennsylvania. The bait is road-killed deer dumped into a small clearing surrounded by tall trees where golden eagles can perch. The bait should be opened along the legs and abdomen to draw in common ravens and other birds that, in turn, alert eagles. Like Paula’s bait, it must be wired to keep it from being dragged off by other animals. The camera should be oriented to the north because that ensures that the sun is to the side or behind the camera, thus preventing white photos. The study is run from January 1 to February 15, and we are hoping to find a good place on our property for Paula to set up a camera. Hunters in the United States, who first popularized the use of cameras to monitor deer presence, should feel proud of how useful these cameras have become in wildlife monitoring and conservation.